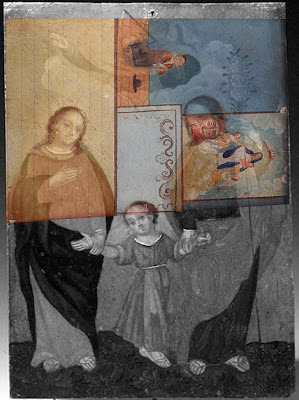 HERE'S AN IMAGE OF AN EX-VOTO (TOP) BY THE ALMOND-EYE PAINTER SENT TO ME BY JAMES CASWELL. THE EX-VOTO'S BEEN PAINTED OVER AN EXISTING RETABLO OF LA SAGRADA FAMILIA (BELOW- I'VE PHOTOSHOPPED A RETABLO DEPICTING THIS IMAGE OVER THE TOP OF THE EX-VOTO IN BLACK AND WHITE). 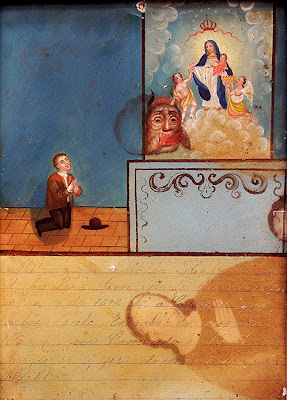 I'M INTERESTED IN THE REUSING OR RECYCLING OF DEVOTIONAL PAINTINGS AS IT ILLUSTRATES THAT THESE IMAGES WERE ABUNDANT IN MEXICO AT THE TIME, YET IT CONTRADICTS THE POTENT NATURE OF THE SUBJECT MATTER. ANOTHER GREAT EXAMPLE OF THIS RECYCLING IS IN GLORIA FRASER GIFFORDS' BOOK MEXICAN FOLK RETABLOS. IT DEPICTS A RETABLO OF VERONICA'S VEIL THAT'S BEEN CUT UP TO MAKE TEMPLATES FOR THE SOLES OF LEATHER SANDALS. I'LL HUNT IT OUT FOR NEXT WEEK'S POST.